San Francisco: A few weeks ago the General Motors OnStar media rep called and offered me a new GM vehicle to road test with the OnStar communications system fully activated. Of course I said, sure send it over, and I’ll let you know what I think about it. So in rolls a 2005 Hummer H2 SUT, a Sport Utility Truck model with a pickup bed in the back. OK, do they really think this thing is gonna get stuck in the mud and need a tow? Well, of course not. GM’s OnStar system can do a lot more that call a tow truck. OnStar does lots of other things too. It’s like having a full time personal assistant to check things anytime you want, just by pressing a button. If you go for the Luxury and Leisure package you can get info on movies, dining and hotels. For a little less you can find a 7-11, a gas station or get directions to Grandma’s house. Even the basic package for only $16.95 a month comes with 10 security and roadside assistance packages that can locate your vehicle if it’s stolen or just lost in the mall parking lot. OnStar can do a lot of great stuff, but most of all it adds an extra layer of trust and security to any road trip you take, from traveling across the country or just across town. The system is installed on virtually every car, truck and SUV General Motors makes and that includes Buick, Cadillac, Chevy, GMC, Olds, Pontiac, Saturn, Saab and of course the Hummer line. Since this is a GPS satellite communications product, and can be used just about anywhere on earth, a very select group of additional vehicle manufacturers have it too. Car companies like Acura, Audi, Isuzu, Subaru and Volkswagen and several motor home coachbuilders including American Coach, Fleetwood, Monaco and Newmar offer it as an option. The OnStar system is an always-on, communications system that activates automatically when the vehicle exceeds certain physical dynamics or the air bags deploy, like in an accident. The system calls the OnStar operator and they will ask you, live and in person over the voice system, if your OK, need any help, or were just involved in a crash. Since the good folks at OnStar were kind enough to give me a Hummer H2 as a demo vehicle I knew I just had to take this thing some where to check it out. The first opportunity came up pretty quick as my wife and I were headed out to a semi-formal dinner. When she was getting up into the Hummer she broke a nail. Now being a resourceful Hummer driving, OnStar guy, I rushed to push the OnStar button. Soon a woman’s voice crackled over the sound system telling me to remain calm and every thing would be all right. As I quickly wrote down the name, address, phone number and locations of the nearest 32 nail salons in the immediate 10-block area, I knew we were all safe. Well, Ok, this never happened, but you get the drift, OnStar is there to help you out with whatever you need, from your personal needs to your automotive needs. On the next day I called my buddy Ed and said lets talk a real road trip up to Petaluma and go to the auto swap meet. Since I’m always looking for car parts for my old cars this seemed like a good way to road test the Hummer H2 SUT, check out the swap meet, and if we got lost, use the OnStar system to find our way back home. Hummers H2’s are nice riding three ton trucks that can do a lot of things, but mostly they just circle the malls with kids in them, and that’s ok too. The Hummer drove like all Hummers do, just great. The drive up to Petaluma was very pleasant as the warm sun was shinning through the massive sunroof and everybody was checking out the Hummer H2 SUT with the small and functional pickup bed in the back. One of the neat features on the Hummer H2’s is the one touch, all-window down feature that lowers the door windows and the heated, rear mid-gate glass window all at once. The system has a one touch up button also. This allows you to cool down the truck very quickly and the huge sunroof has a one touch open feature too. While the Hummers are all equipped with power everything, leather and great sound systems, this Hummer had the chrome dress up package with grill guards, step plates and roof rails plus the polished alloy wheels. Not only did it ride and drive great, it looked great too. While we did not have to call up the OnStar folks for directions or make a reservation for lunch, it was nice to know that if we did need help or were involved in a fender bender, the OnStar people were only a push button away. The Hummer H2 is a very safe vehicle in it’s own right but having OnStar just adds that extra blanket of security and it’s nice knowing it’s always there, always On, always ready. To learn more about OnStar go to www.onstar.com or call toll free 1-888-4-OnStar (1.888.466.7827). 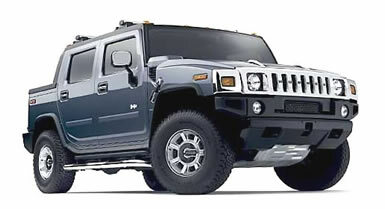 To see the new Hummer H2 SUT click on www.hummer.com or call your local Hummer dealer for more information.